Starting from October 2017 ebay introduce strict security standard for ebay auctions. What does it mean and how to solve the problem with https, read in our article. 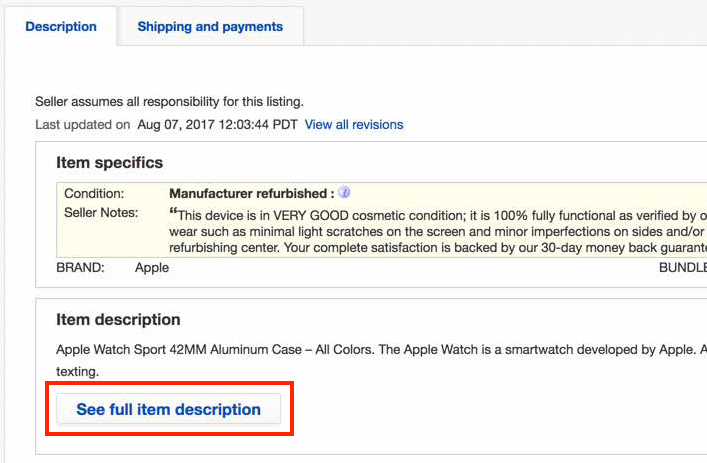 If your listings contain a reference to not-https resource ebay will hide your ebay item description and instead show button "See full item description". It will look like something like this. How to solve it and how to detect this issue on your ebay account. 2. If you see warnings and errors in bulk checker try to check your ebay description template and fix errors. Before checking and fixing PrestaBay ebay description template please make sure that your store has SSL certificate. Open your store start page and check address line. You should see "gree" badge and https in your store address. If your store doesn't have "SSL" certificate installed, we can suggest you contact your hosting with a request to enable SSL for your PrestaShop store. If your store already has an SSL certificate, you can check description template. As the first step please open your Description Template for edit. In PrestaBay — PrestaShop ebay Integration module you can do this in "Catalog->Ebay->Selling Profiles->Description Template". And click for "edit" of your description template. If you have enabled Visual mode for the template, disable it. Search inside ebay description for having "http://" references. Replace all http reference with https. Please notice link could remain unchanged, but a reference to images, css (style) should be changed to https. After you finish this, click on "Save" and then make a "Preview" of your template. If you are using PrestaBay 1.7.x and older please consider to upgrade to latest module version, otherwise link to images could be generated not correctly (with HTTP link). When you finish update description template, you need to do "Full Revise" of all your active ebay listings. But before this, we can suggest you do revise of couple ebay listings and make sure that all SSL issues is solved.